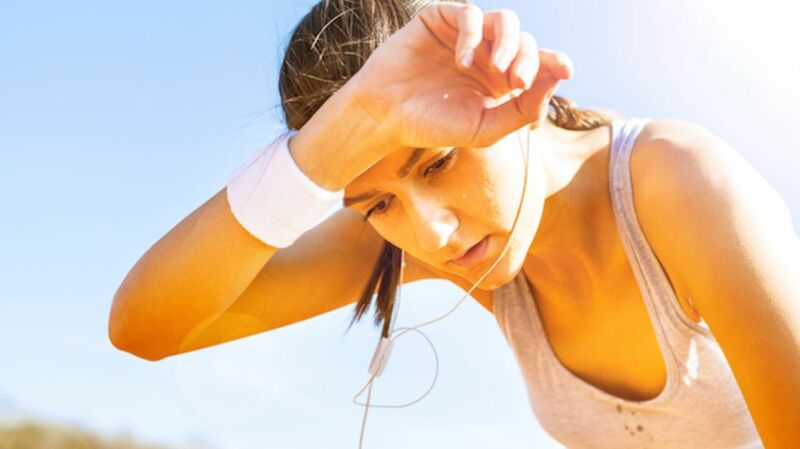 Exercising in the summer can be a conundrum—you want to maintain your regular routine so you can make the most of summertime activities like surfing and biking, but sweat sessions in extreme heat can be excruciating. Lucky for you, there have been lots of studies examining how simple tweaks to your approach can help you work out harder and last longer. The bottom line: Anything you can do to keep your core body temperature as low as possible is key. Read on for strategies, backed by recent scientific research, to help you do just that. 1. DOWN A SLUSHIE BEFORE YOU GO OUTSIDE. Yep, you read that right: Consider this your permission to drink a Slurpee (or maybe an alternative with less added sugar). In a 2009 study published in the journal Medicine & Science in Sport & Exercise, sipping on 7.5 grams of a sweet, frozen drink per kilogram of bodyweight (which works out to be about 16 ounces for a 130-pound adult) 20 minutes before a run was shown to lower runners’ core temperatures for 30 minutes. Runners were also able to go 10 minutes longer after drinking the slushie, as opposed to after drinking sweetened cold water without ice. Holding an icy-cold towel against your neck while you are exercising can help you go longer without fatiguing, according to a study published in the Journal of Athletic Training. Similar research has shown that chilling your skin with a towel can help you up your workout intensity, too. If you’re running around a track, stash a cold towel on the side—so you can cool off again mid-workout. Or carry a Mission Enduracool towel with you, tucked into a pocket or waistband; its special microfiber fabric gets seriously cool when you douse it with water and wring it out. This one sounds a little weird and makes us squirm, but if you can stand holding ice against your thighs while you warm up before the main event, it might help you go harder. Athletes who did so shaved, on average, 85 seconds off their time running a 5K in 90-degree heat (although there was wide variation), research from the University of Brighton in England showed. (Wearing an ice vest beforehand helped too, but not as much—after doing that, study participants ran 48 seconds faster than normal, an increase the researchers deemed not statistically significant.) If you want to give it a go, try the Compression+ICE shorts from 110%; they come with packs you freeze and then slip into pockets along your quads, hamstrings, and glutes. 4. POUR SOME H20 OVER YOUR HEAD. Drinking icy water (unsurprisingly) lowers your body temperature more than drinking less chilly water, but dumping a cup of cold water over your body makes your temperature drop significantly more, according to an article from the University of Sydney’s Thermal Ergonomics Laboratory. When the liquid evaporates from the surface of your skin, that’s what cools you down. The more of the water that covers your skin, the better its chilling action works—but if only 15 percent of the cup actually evaporates from your skin, that’s enough to cool you down more than drinking the water.